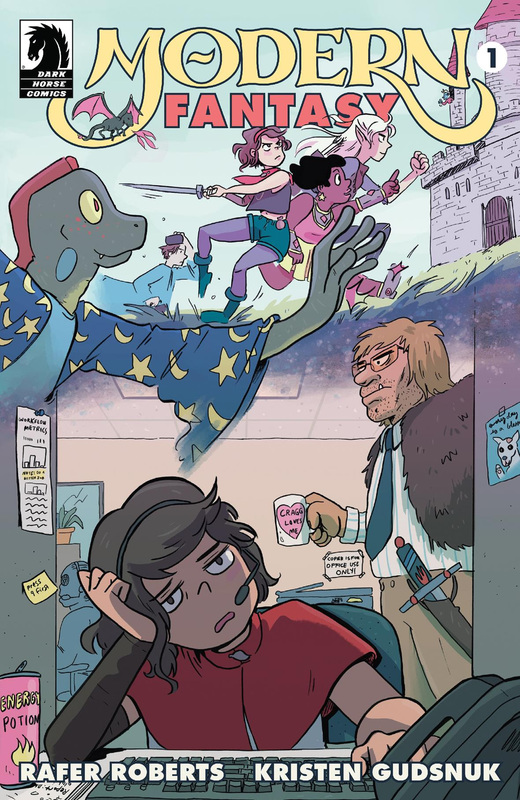 Modern Fantasy #1 review: Adult Swim meets Dungeons & Dragons and has an affair with Office Space – AiPT! How would a barbarian react to everyone getting the good snacks at a meeting? “What if?” stories are prevalent in the comics world. So is taking the fantastic and reimagining it as part of the mundane. In Modern Fantasy #1, writer Rafer Roberts and artist Kristen Gudsnuk have created a “What if?” story that goes right to the heart of modern, millennial drudgery. How would a barbarian react to everyone getting the good snacks at a meeting? What would high elf designer drugs do to a halfling corporate drone? What does the cleric who lives in the apartment upstairs look like with his robes off? All these burning questions and more are answered in the first issue of Dark Horse’s newest fantasy comic. I am personally a sucker for any subversion of fantasy tropes, and seeing our heroine, Sage of the Riverlands, ride the subway between a giant insect and a bugbear, take selfies on her iScroll, and slog her way through the existential dread that is corporate fantasy land just works for me. On top of that, Gudsnuk’s art is right in line with the writing, evoking shows like Steven Universe while maintaining a mature and measured use of detail to get the story across. From the deadbeat lizard and his deadbeat thief of a boyfriend to the monsters and creatures that populate Sage’s monotonous daily routine, Gudsnuk has captured life in millennial America draped in trappings from the fantasy realm that she and Roberts clearly get. If the first issue is any indication, many magical mysteries are afoot behind the scenes, including the question of when the abandoned floating castle might plunge to the ground, destroying everything in its wake. Fun times. Gotta run. Late for a meeting on synergizing assets that should only last four hours. Text me on my iScroll.